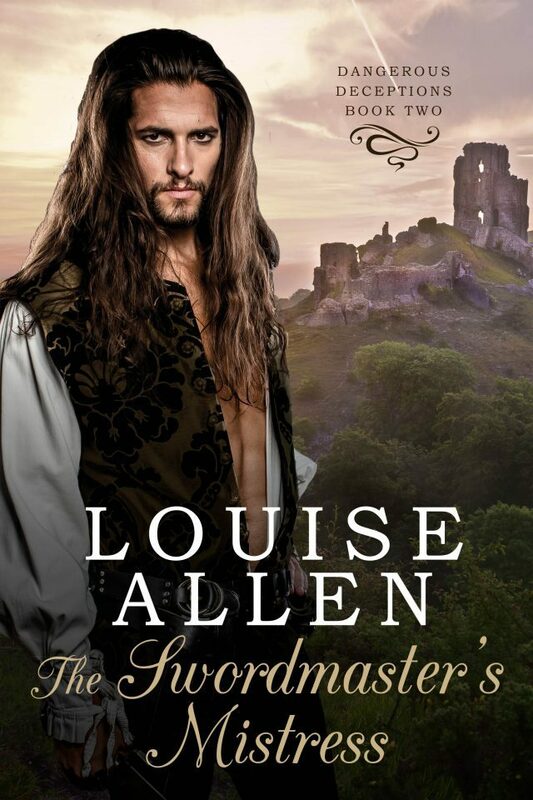 His old employer, the Duke of Calderbrook (Loving the Lost Duke) is clear of the danger that haunted him but Jared Hunt is a man for hire – a swordmaster who is quite happy to take on the duties of a temporary bodyguard while he is waiting for his new salle d’armes to be finished. What he doesn’t expect is to have his new employer murdered within days and the widow, who he was hired to protect, left vulnerable, both to the killer and to charges of murder. To protect Guinevere, Lady Northam, Jared must return to the county of his birth, risk his carefully-constructed identity, his pride, his life – and his heart. The Viscount’s butler took him through to Northam without delay, pausing only to take the scabbard and sword belt he was handed. The promptness was interesting. Most gentlemen, in Jared’s experience, liked to assert their superiority by keeping an inferior waiting a while. True, swordmasters were several steps up on dancing masters, apothecaries and curates. They were equivalent, in most gentlemen’s eyes if not those of their wives, to lawyers, doctors and the vicar. But of a certainly they were not equals. Cal treated him as one because they were friends: Jared did not make the error of expecting any other aristocrat to do the same. Well that was amiable enough. Jared contented himself with a polite inclination of the head, settled his feet apart, put his hands behind his back and waited, apparently all his attention on the man in front of him. He also noted the other doors into the room, the quality of the furnishings, the books on the side table, the faint sounds of the household beyond the closed doors and, automatically, the various escape routes. A pleasant room, in good taste, a little cluttered with the accumulation of years of living, a little worn around the edges for ease, not from want of funds. A warm, comfortable space that spoke well of its owner. ‘Come, take a seat.’ Lord Northam lowered himself stiffly into one of the wing chairs before the cold fireplace, using the back and the arm as props. It was the first real sign that betrayed his age that Jared had noticed, beyond the sagging skin and the grey hairs. Jared took the seat opposite, crossed his legs and waited. He was good at waiting. ‘You were recommended to me,’ Northam said abruptly. Michael Flynn was Cal’s valet, their companion on their travels and a very good friend to both of them. He would have vouched for Jared even if Jared had been putting himself forward as Archbishop of Canterbury. But as for anyone else – those must have been the male guests at the house party where Cal almost lost his life and the mystery of the near-fatal illnesses that had sent him abroad as a young man was finally solved. It was troubling that guests had realised there was a situation to be dealt with. Cal’s injuries and the death of another house guest had been ascribed to accidental causes and at the time no-one had shown any sign of believing otherwise. Jared kept his expression bland, despite the urge to snort with laughter at being described as the god in the machine. ‘Knives and an arras, my lord? That is as much Hamlet as Machiavelli. No-one was knifed, you have my assurance.’ Poisoned and shot, yes. Knifed, no. He waited. One heartbeat, two… Ah well, I will just have to hope the old man is not a gossip. He placed his hands on the arms of the chair and prepared to stand. Jared unfolded it and found himself holding a bank draft. An exceedingly large bank draft. He lifted his gaze to meet that of the old man steadily watching him across the few feet between them. ‘And what would I have to do to earn this?’ It seemed to be about half the going rate for assassinating a royal duke or robbing the Bank of England.